As seen in the second article, the figure-8 body motion is undeniably what separates the great or natural athletes from the good ones. But, more importantly, anyone can learn this “magic move” and easily apply it to their sport or activity. So how is it done – this figure-8? Most of us need some help when it comes to learning and engraining this figure-8 motion in our bodies. The 8 Board is the only training device that trains the body to make this figure-8 motion and it is invaluable for anyone wanting to be a great athlete. Begin by first adjusting the 8 Board to the proper height, which is, for most sports, hips to shoulders width apart: for baseball slightly wider, for skiing slightly narrower. Place the 8 Board on the flat ground, be it a tennis court, golf driving range or on your living room floor. Then carefully, holding onto something if necessary, stand with your two feet in the center of the two swivels. Start with the proper posture, standing in a neutral position “zero point”: facing forward with your hands in front of you, feet parallel to one another shoulders width apart, toes forward, back straight, eyes looking straight ahead, knees very slightly bent. You should feel relaxed and balanced before you begin. Now clasp your hands together, all except the thumbs and index fingers, which form a “pointer” by pressing them together, index fingers now pointing the same direction as your toes. To complete this initial stage, attach your two elbows to your sides (ribs), locking your arms and fingers, creating a triangle, with your chest completing the form(far left diagram). Now move the two swivels of the 8 Board from side to side, slowly. Focus on moving continuously with balance and comfort. Next, imagine there is a chalkboard directly in front of you. Using your imagination draw an infinity sign, approximately two feet in size, on this chalkboard in front of you. Move your index fingers, your “pointer”, and begin by raising them up and to the right. Continue drawing the infinity form by next rounding the corner with your “pointer” and then rising again up and to the left. Complete the infinity sign and continue slowly and continuously, without stopping to follow in this form. Now, it is imperative to remember two things. 1. Keep your elbows attached to your hips. This assures that your feet and hips move with the movement of your fingers. 2. As you come from “zero point” (which is the center point of the infinity sign, or the “X” directly in front of you) make sure that you rise into each turn. So you rise into each turn coming from your center, and then fall as you round the corner. Now you should be moving your entire body, like a moving statue in this continuous infinity sign, or sideways figure-8 path of motion, driven by your index fingers. You’ll notice as your hands swing from side to side in this continuous motion that your weight will alternately shift slightly from one foot to the other. Simultaneously you’ll begin to feel the muscles in your abdomen working to bend and straighten while your body twists and straightens throughout the movement. Once you can perform this sideways figure-8 motion, or infinity sign, begin to initiate the motion from your core, centered in your hips and abdomen. Feel how it’s your “center” that “pulls” at the arms and legs, dragging them behind. It’s this flow emanating from the hips to your extremities that is the magic move of a natural athlete. The core starts the motion, which is then transferred, or “ripples out” to your arms and legs. You are now doing the figure-8! This feeling of a “natural throwing motion” once learned, can be applied to every sport’s motion, from hitting a tennis or golf ball to the spinning of a figure skater. Watch a short-stop in baseball in action. He catches and throws all in one fluid and continuous motion, as natural as a fish in water. All sports, activities and general well-being can be enhanced by understanding how the entire body interacts as a “human web”, whereby when one part of the body moves, every part of the body moves, in relationship. Once a person develops this balanced fluidity through practice, it becomes “muscle memory” and applicable to sports. Now, let’s use the 8 Board and figure-8 motion for sports. For both “throwing and “swinging” sports’ motions, including but not limited to swinging a tennis racket, baseball bat, serving a volleyball, throwing a baseball or football, even kicking a soccer ball – the 8 Board is placed at a 45º angle to the target or oncoming ball. It is at this 45º angle that you have the most balanced and optimal hitting point. 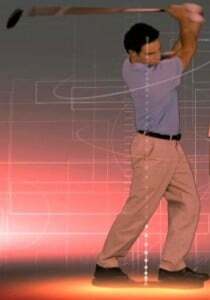 By swiveling back and forth on the 8 Board your entire body creates a wave, going out to the throw or hit, like cracking a whip. Golfers have two great ways to use the 8 Board. 1. Practice (at home or on the driving range) your swing with or without a club. Place the 8 Board parallel to the ball, just as if you’re just going to drive the ball normally. 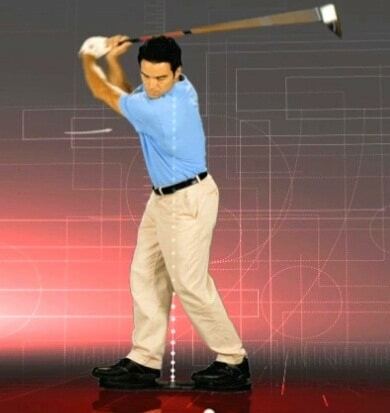 Keep swinging and try to remain balanced while you swivel in and out of the stroke. It helps prevent “sway” dramatically. When you get off the 8 Board your feet now feel “rooted” in the ground and “centered.” You will hit effortless and controlled long balls, like never before! 2. To improve putting and the short game, golfers use the 8 Board in a very special way. Stand on the 8 Board and try NOT to move the swivels at all. There are a multitude of muscles from the knee to the foot, and all too often a golfer moves too much of their lower body on putts and chips. 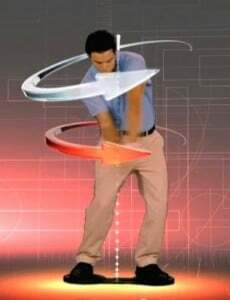 All golf pros will tell you that you only want a “pendulum” swing from the shoulders – and no legs or hips! The 8 Board trains a “quiet lower body” for more precision putting. 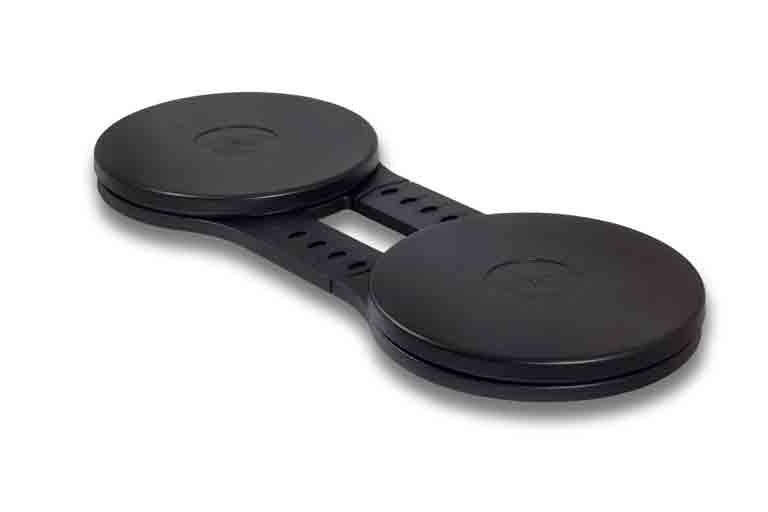 Surfers, skiers, snowboarders, skaters, basketball players use the 8 Board to improve balance, flexibility and coordination. Along with doing the basic figure-8 motion, practicing spins is an excellent way to develop perfect dynamic balance. While doing the figure-8 motion on the 8 Board, as you turn to one side, lift up the opposite foot and spin around in a circle on one foot – then spin the opposite way. You must be in your center of gravity to perform this move with poise. All sports, at their highest levels, require fluid, balanced and explosive movements. All athletes can enhance their performance training with the 8 Board, and “living into” the philosophy of “non-linear”, figure-8 motion. Athletes have begun to use the 8 Board with other fitness aids such as weights, elastic straps and the medicine ball. The 8 Board ensures that you use your entire body in balance, while performing in your sport. Don’t strive to be good, get on an 8 Board and learn to be great! Jack Broudy and Paul Mayberry are co-developers of the ‘8-Board’. A training device designed to enhance learning and using the nonlinear figure-eight motion.